Here’s another one worth talking about. We’ve recently rebuilt the batch printing functionality to give you more granularity and control, and to make it harder to accidentally send hundreds of tickets to the printer. It works pretty much the same as it always has done, but there are a few things about the way it works that you might not notice unless you were told. You can search for items which have been delivered, not delivered, or either (“just give me everything that was set to post whether it’s been posted or not”). From here you can sort the batch - and the order that they’re sorted in is the order they print in, start printing, and stop printing. Whilst the batch print is running, the server searches for the next order the queue, prints it, and then searches for the next order again, until there are none left. This means you can re-order the queue at any time, as the next order to be printed isn’t decided until the server is ready to print it. If you stop the batch printing, documents that have been rendered but not yet sent to the printer will carry on being sent to the printer, but no more documents will be rendered. 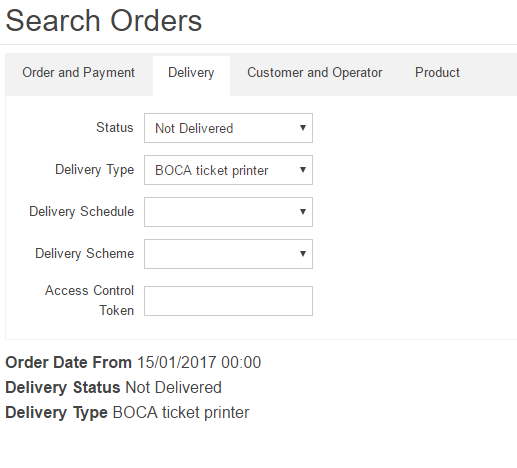 If you go to an order that has outstanding delivery items and press the “Print” button on the order details page, it will clear the queue for your session if there is one - we assume that this isn’t the sort of thing that you need to do whilst batch printing. The batch print queue is per-session - we thought about making it per-printer but that would make managing it more complicated, and you’d have to think about swapping printers back and forward during a session. Get half way through a print job and lose track when the printer jams and have to go through the tickets one at a time working out what’s been printed and what hasn’t.